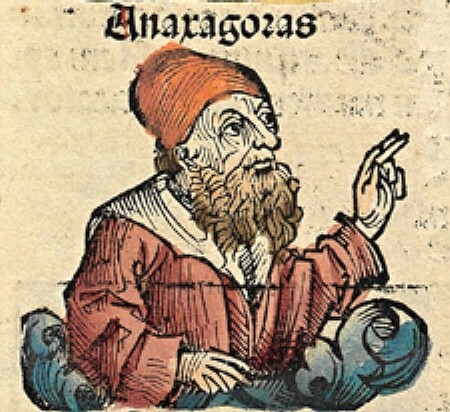 Anaxagoras (500 – 428 BCE), who is neither Anaximander nor Anaximenes, no matter how frustratingly close their names are to each other, was born in Clazomenae, another of the ancient Ionian city states in what is today Turkey that rebelled against Persia together with the help of Athens. Anaxagoras may have fought on the side of the Persians, against the independence of Ionia. Many Greeks did, both those loyal and connected to the Persian empire and those who were merely paid as mercenaries. After Anaxagoras’ considerable property was destroyed, sources say he gave up on possessions and turned to seeking knowledge and wisdom. 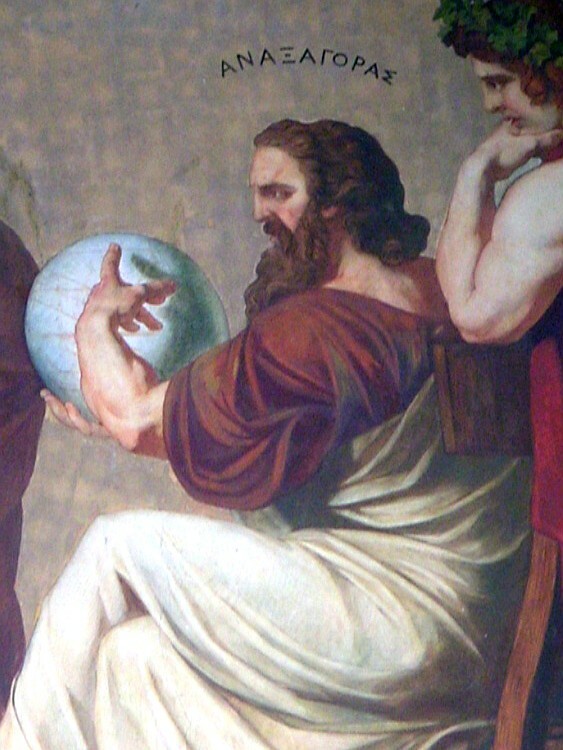 Anaxagoras is said to have been the first to bring philosophy to Athens, where he arrived in 465 BCE. 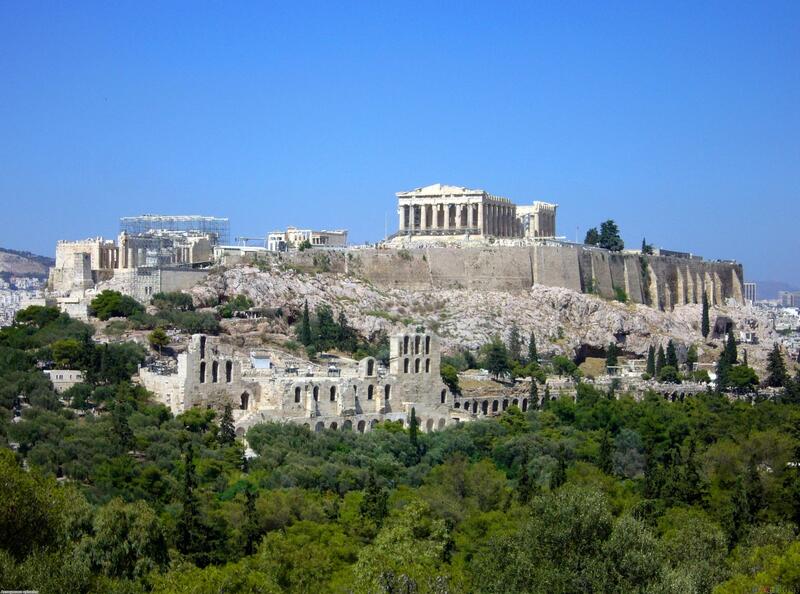 Athens was becoming the wealthy center of Greek culture, which is how they were able to support the rebellion of Ionia at the time. It would have been in Athen’s interests to dominate Greek trade and not give a cut to Persia. 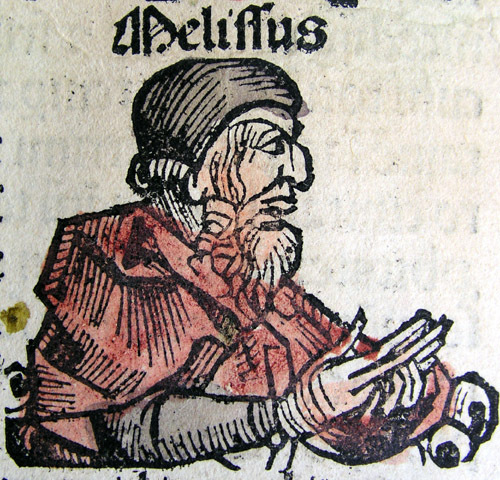 Anaxagoras taught Pericles, the famed Athenian general, and was admired by Euripides, the Athenian poet and playwright. Anaxagoras stayed in Athens for thirty years before returning to Ionia. Many scholars today note the similarities between Anaximenes and Anaxagoras, suggesting that Anaxagoras, like other Anaxa-whoevers we have studied, is continuing in the Ionian tradition. Agreeing with Anaximenes but disagreeing, Anaxagoras thought the earth was flat and a strong current of air supports it, and disturbances in the air under the earth cause earthquakes. Like Thales, Anaxagoras believed that plants have minds/souls and purpose. Like Pythagoras and Parmenides, Anaxagoras believed that male children are born from the right side of the uterus, and females from the left. He also theorized further that male children come from the sperm of the right testicle, and females from the left, which is why they attach to either side of the uterus. Thus, “I would give my right testicle”, would mean, “I would give my unborn sons”. Anaxagoras did cosmology, explaining meteorites and eclipses. Plutarch says that Anaxagoras predicted the fall of a meteorite in 467 BCE, by ancient standards proof of his cosmological views but by modern standards impossible. 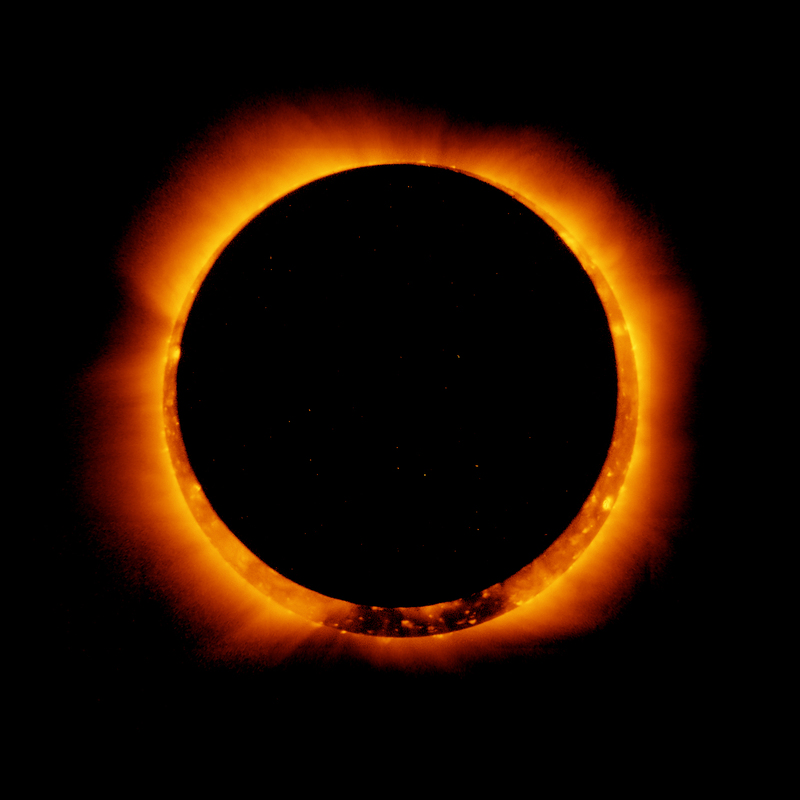 He argued that the sun was a mass of heated metal, like that worked by a blacksmith. He said the Moon reflects the light of the sun (correct), that the moon has mountains (correct) and that they were inhabited (incorrect as far as we know). The sun and stars are masses of stone kicked off from the earth, ablaze by rapid rotation, in line with the Pythagorean account of the cosmos for the stars but not for the Sun. Strangely, Anaxagoras also argued that egg whites are bird’s milk. Like Socrates, he was charged with impiety, with irreverence to the gods for these explanations (of the Sun and Moon, not bird’s milk). Athens was not as accepting of a place as Ionia for cosmological speculation, as Anaxagoras discovered. Saying that the Sun was a rock on fire was apparently acceptable in Ionia but heresy in Athens. In Plato’s Apology, Plato’s account of Socrates’ trial which we will study soon, Socrates is asked by the prosecution whether or not he thinks the Sun is stone and Moon is earth, and Socrates responds by wondering if he is being confused with Anaxagoras. Socrates says that neither the jury nor his young students are stupid enough to believe that he would hold such absurd views. Clearly, the Athenian assembly has Anaxagoras’ impiety in mind as they prosecute Socrates for the same crime, and Socrates is aware of this and distances himself from Anaxagoras. 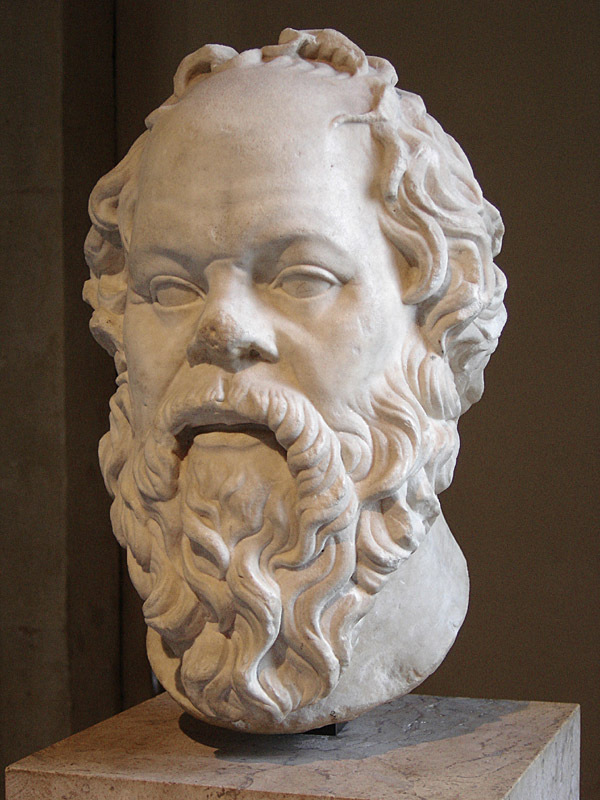 Socrates was not concerned with cosmology, arguing instead about ethics and our ability to acquire knowledge and wisdom. 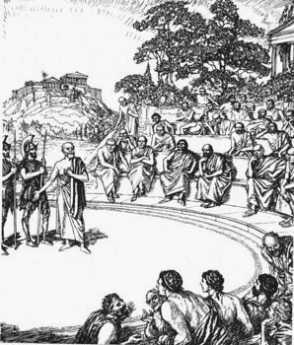 Anaxagoras was put on trial in Athens. 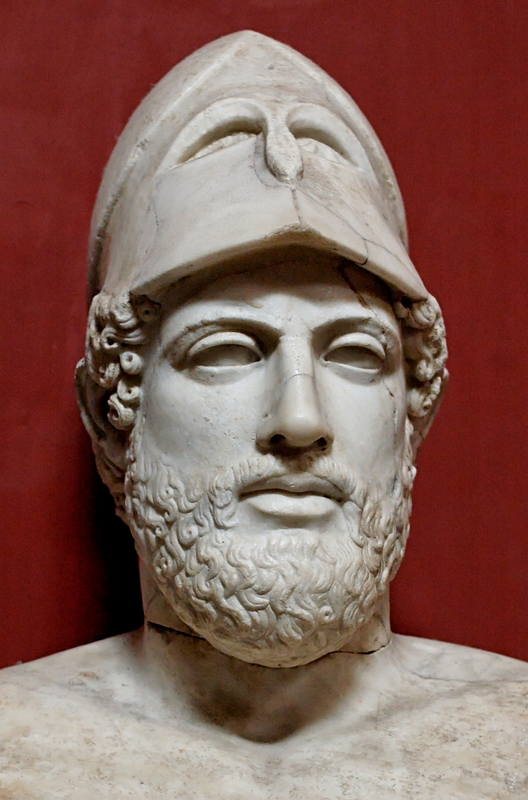 According to some sources, Pericles spoke in his defense, but Anaxagoras was still sentenced to death, after which Pericles helped him to flee to Lampsacus in Northern Ionia. According to others, Pericles sent Anaxagoras to Lampsacus before he could be put on trial as Pericles was himself losing favor in Athens. 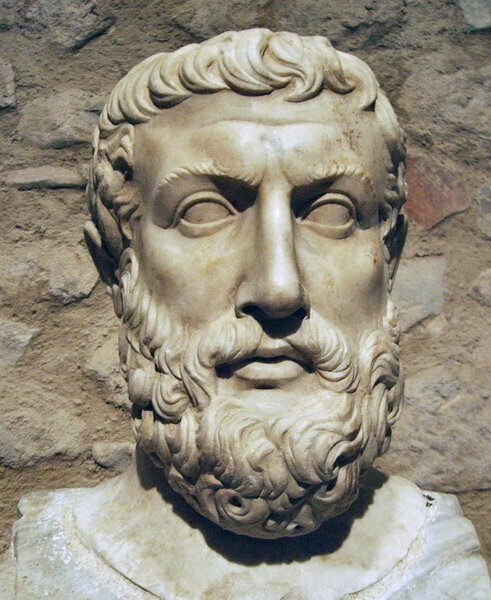 Either way, Anaxagoras left Athens with the help of Pericles for Lampsacus to continue his work until his death there less than ten years later. Only fragments of his philosophical work survive (sound familiar?). Diogenes Laertius, who we hear from constantly, said that Anaxagoras composed one short work which could be purchased for one drachma. 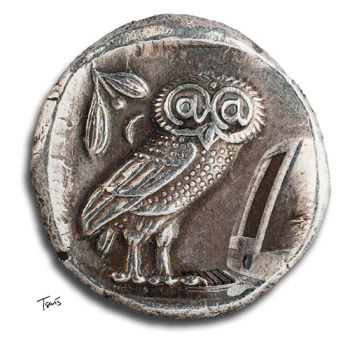 Socrates in Plato’s Apology says that the youth would not come to him for answers if he held the foolish views of Anaxagoras, as they could purchase these ideas for a single drachma at the market. According to Anaxagoras, the cosmos has always existed, but originally it consisted of tiny fragments of elements mixed up. Even as everything separated, each thing contained traces of everything else, which is how transformation is possible. Anaxagoras wrote that “All things are in everything”. Originally, everything was a homogenous mass, and out of this things developed into what they are while still containing traces of every other thing. Anaxagoras noted that if food becomes various parts of animals and humans, becomes skin and bone and hair and muscle, food (as well as matter in general) must already be these other things. There were seeds of things (spermata, a strange yet familiar term), of humans, animals, and plants, but these were undeveloped, intermixed into everything before they separated and developed. This is Anaxagoras’ response to the Eleatic challenge. Being always was, as Parmenides argues, but the differentiation of things is not an illusion but a slow transformation that does not categorically or entirely remove any particular thing from any other thing. Anaxagoras would agree with Parmenides that fire is one and the same as everything that is not fire, and that fire as a component of being always was and always will be, but Anaxagoras argues that fire is relatively distinct from everything that is not fire. Fire became more distinguished, but all things contain fire and fire contains the seeds and components of all things. Through the process, fire became much more fiery than everything else, which remained far less fiery. Anaxagoras here seems like Melissus in negotiating with Parmenides’ Eleatic challenge. While Anaxagoras disagrees that distinction is an absolute illusion, distinction is a relative illusion insofar as we perceive fire as simply not water and water as simply not fire. Fire is water, but much more so fire, and water is fire, but much more so water. Being is one and the same thing without a particular character in that it has all character, just as Melissus argues to make sense of Parmenides, but particular beings are relatively what they are and relatively not what they are opposed to. Difference is an illusion, but only relatively, as all things are relatively different, not completely different. Anaxagoras said that the cosmos is ordered by mind, ‘nous’ in the Greek. It is mind that separated the like from the unlike, the similar from the different. Mind was pure and independent, strikingly like God above the chaotic waters in the book of Genesis. Anaxagoras noted that mind clearly rules animals and humans, the higher and more developed forms of life. Mind is in some things, such as plants and bears and humans, but not in others while it still directs the process of all things, including rocks and sand. Anaxagoras uses the metaphor of human beings, who carry inanimate objects such as honey and milk, and lead the lower animals such as cows in the direction we wish them to go. 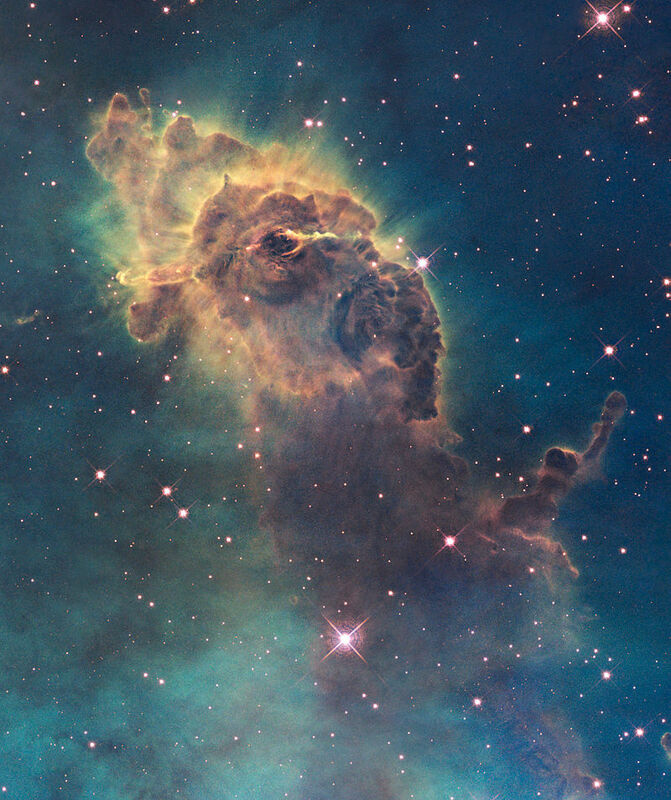 Likewise, the cosmic mind moves the inanimate and leads the animate through the cycles of things. Mind is alone, by itself, ‘self-ruled’. Like Xenophanes, it does not seem to be affected by things but knows all things and moves all things. Plato was influenced by both Heraclitus’ Logos and Anaxagoras’ Nous. While Heraclitus already implied that the cosmic fire was a great mind that speaks order downwards, Anaxagoras explicitly refers to the highest ruling component of the cosmos as the element ‘mind’. This is identical to the Indian philosopher and logician Kanada of the orthodox Hindu Vaisheshika school, who considered both mind and void to be basic elements of the universe. Mind rotated the chaotic mixture, just as the sun and celestial bodies move in circles and the processes of life and the elements work in cycles on earth. Things gradually were separated out into what they are today, not sharply or immediately divided. 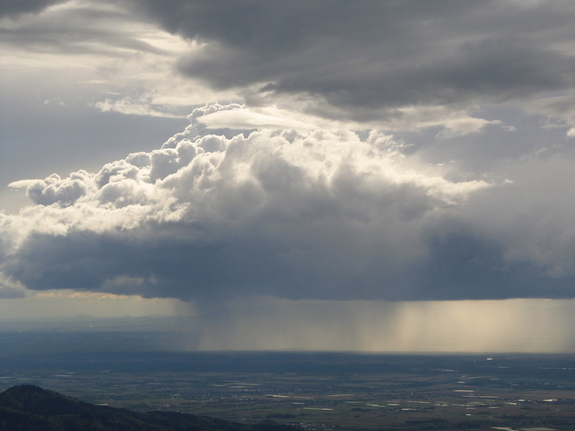 This follows Anaximenes in condensation and dissipation as basic dynamic of the elements. First were separated the cold mist from the warm aether, a primal cold mixture of water and earth from a hot mixture of air and fire. The cold further separated into water, earth and stone, and the hot and seeds of things mixed into the earth, producing warm clay, in which spawned first plants, and then animals and humans. 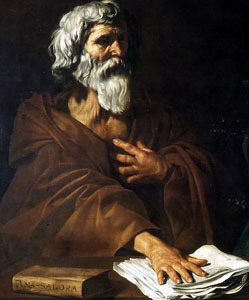 While Anaxagoras was not an atomist, his theory paved the way for later atomists’ theories and the passage of philosophy from Ionia to Athens. Anaxagoras criticized Empedocles for saying there were four root substances of fire, water, earth and air. Anaxagoras argued that skin and hair are just as real and basic as fire and water, and there are no root substances other than matter itself. While skin and hair do have fire and water in them, or at least the seeds and components of fire and water, so also do fire and water have the root components of skin and hair within themselves. 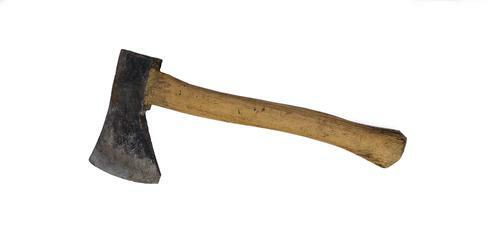 Anaxagoras says that things are not “split apart with an axe”, are not categorically and totally separate from each other. He specifically states that hot is not split from cold with an axe, like Heraclitus saying that even opposing elements are one and the same and only relatively, not categorically, distinct. Against Empedocles, Anaxagoras argued that there are no primary and secondary substances, as being is the only primary thing and all other substances are equally secondary to it. Some scholars today dispute how different the two are, as Anaxagoras in some ways seems to posit relatively primary substances that emerged earlier in the slow separation of many beings out of the whole. Anaxagoras says that air and aether dominated at first, the largest elements in size, became relatively distinct first as part of the process, but he is not saying that aether is the primary element. Rather, it is the first element that emerged from the whole to be what it is now. Anaxagoras, unlike Parmenides but somewhat like Zeno, says that things are infinitely divisible. 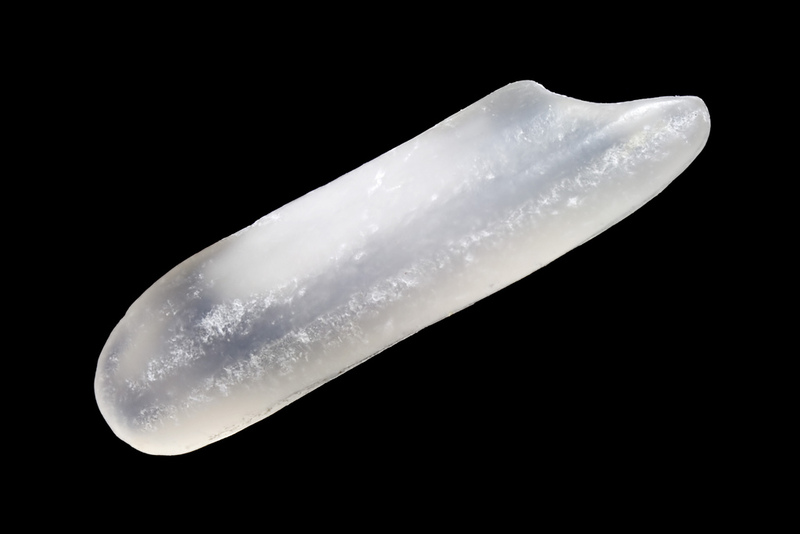 He considers a grain of rice, which he believes has the components of hair and muscle within it. There is no limit to cutting the grain into pieces, just as there is no limit to matter separating out into various substances. While Zeno found this to be a paradox, Anaxagoras states the infinite regress as a matter of fact. The atomists we will study soon disagree with Anaxagoras, and argue that atoms are indivisible and there is no infinite regress of divisibility in answer to Zeno. There remains, however, a problem for Anaxagoras’ view. How can uniform being separate into many substances that are more so themselves? What is the motor or motive of the differentiation if being is originally uniform? Anaxagoras adds mind as an additional force guiding the process, designing the differences between things and their relationships to each other. We still today use the expression ‘deus ex machina’, the god/spirit in the machine/design. The expression is usually used as a criticism of adding in additional elements as an afterthought to close holes in an argument or plot holes in a story. While Anaxagoras makes mind the highest thing, it is separated from the physical processes, which the Athenians found to be impious. The gods are involved with things, not simply the detached highest characterless thing. The Roman Horace brings us the Latin phrase, saying that Greek actors portraying gods in the tragedies were lowered onto the stage when required. Today, in argument, ‘God did it’ or ‘People know that’ or ‘Science says’, any mental presence that simply enters the picture to explain all too simply (Pyramids? Aliens!) can be criticized as employing a ‘deus ex machina’. Aristotle argued against Anaxagoras, saying he put mind in as a final thought to start the whole thing, just as the French philosopher Descartes did to give consciousness and freedom to human beings. 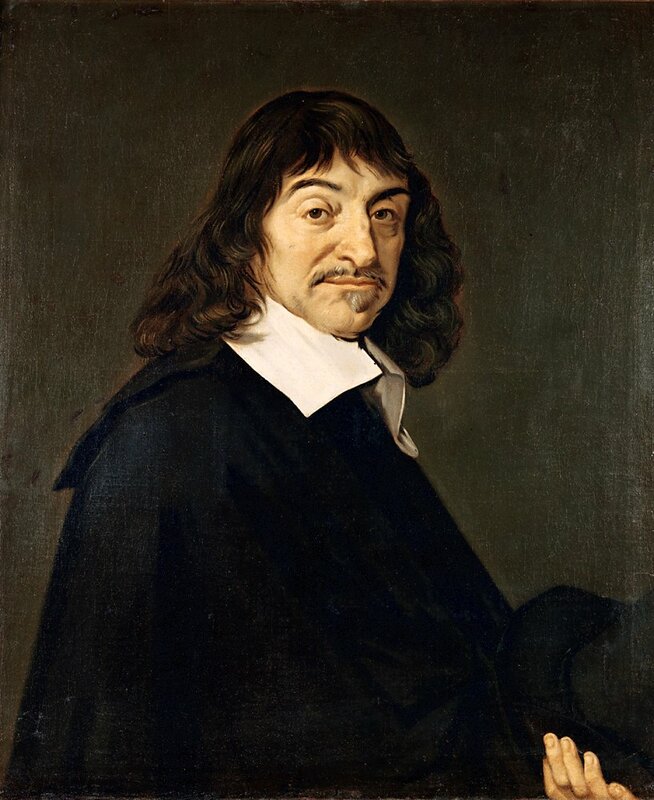 Descartes, like Anaxagoras, said that mind/soul determines the physical but is separate and above, which is why humans have free will. This creates a duality of mind and body for which both Anaxagoras and Descartes were criticized. This is still an issue for philosophy today. What is the relationship of mind to body? The British philosopher and early computer scientist Alan Turing argued that machines can be said to understand things (with the famous example that a light switch understands only ‘on’ and ‘off’), so if a robot can behave like a person we may treat it like a person, but this seems equally problematic. While Searle and Turing attempted to get rid of the hard dualism of Anaxagoras and Descartes, the opposite attempt at simple identity of mind and body leaves problems we are still dealing with. 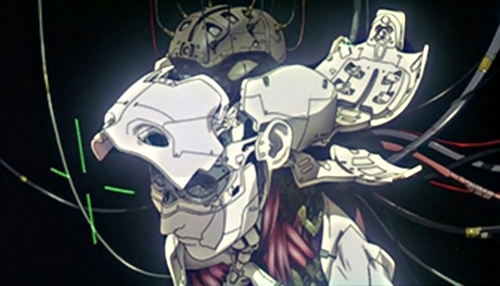 Fans of Japanese animation know that Ghost in the Shell is one of the original two great Anime classics, concerned with the existence of mind as all becomes cybernetic and genetically modified. Anaxagoras and Turing remain the two poles we are faced with as we encounter more complex forms of bio-engineering and artificial intelligence. 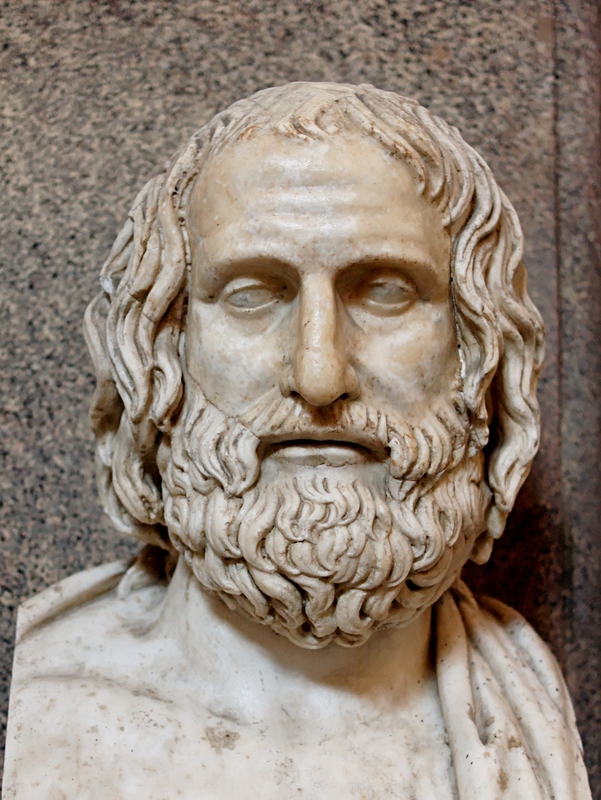 Euripides, great admirer and possible student of Anaxagoras, was ridiculed by his critics for often employing the device of god-lowering crane, particularly to end a play with a quick resolution. Characters, often women who tragically accept their fate, are taken away by a god to safety. Aristophanes, another famed playwright, mocked Euripides by making Euripides himself a character in one of Aristophanes’ plays and lowering him into scene on a crane. 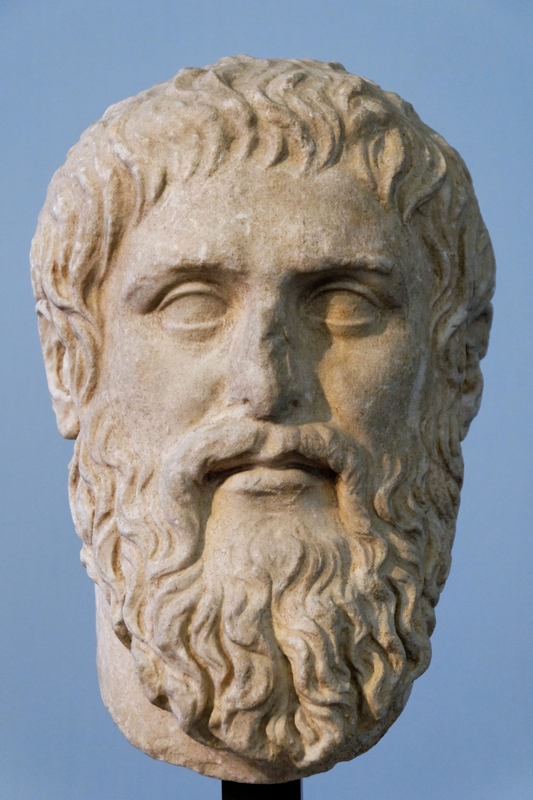 Aristotle criticized Euripides for overusing the device, and said that plots should resolve due to their internal elements and not by an external element in the end. This parallels his criticism of Anaxagoras, who Aristotle says places a pure mind atop the whole to explain it without giving an account in terms of the elements themselves. Aristotle believes in a living and teleological universe, but mind and purpose are physically involved in the process, not separate above. Aristotle criticized Anaxagoras for bringing mind into the picture as the driving force, but then failing to adequately describe what purposes are driving to what ends. In a sense, Anaxagoras is saying that things developed because, “Mind has a plan”, and Aristotle replies, “Yes, but what is the plan, man?”. Aristotle’s work in physics is primarily an attempt to work out the teleological forces and purposes at work in the cosmos, as things work towards their final ends. Anaxagoras’ work drove both materialism and teleology forward, paradoxically. He accounted for the world in largely elemental processes, like the earlier Ionians, but also left a mind in charge without filling in the details, which Plato, Aristotle and other thinkers were happy to supply. In Plato’s dialogue The Phaedo, Socrates says that he was joyful on hearing Anaxagoras at first, but then found that Anaxagoras did not make much use of mind in his system at all.